I have lots and lots of sock yarn leftovers... it comes with the territory. 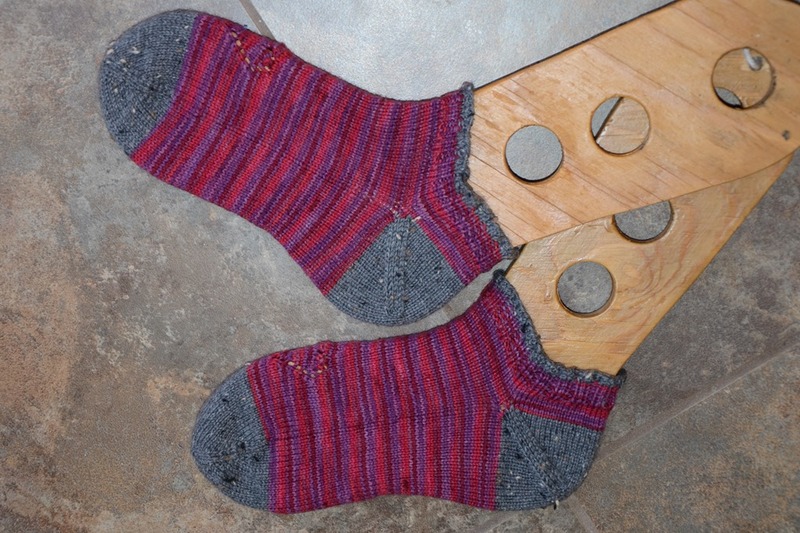 I rarely make socks that use an entire skein. 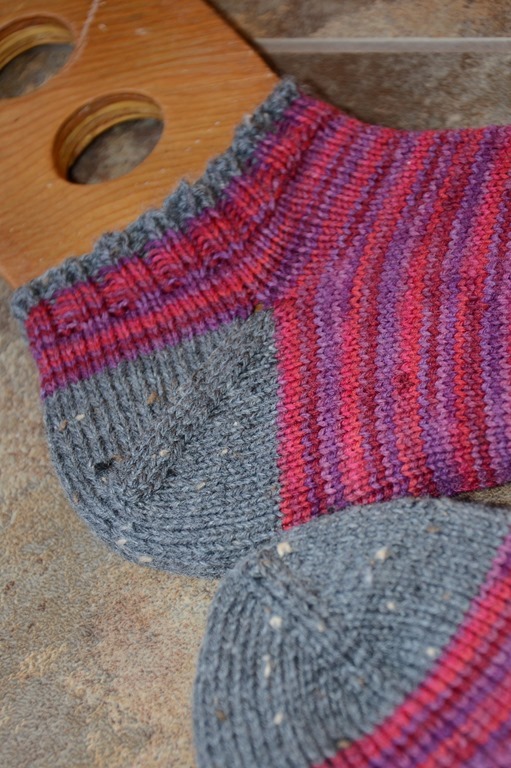 So I thought between the January and February KnitFromStashKAL socks I might try and use up a few little scraps that are cluttering up my studio space! - who needs patterns! (yeah right! We all do sometimes...) I decided to fly by the soles of my feet on this one and make it up as I went! - I began with a Turkish Cast On... aka Toe up. 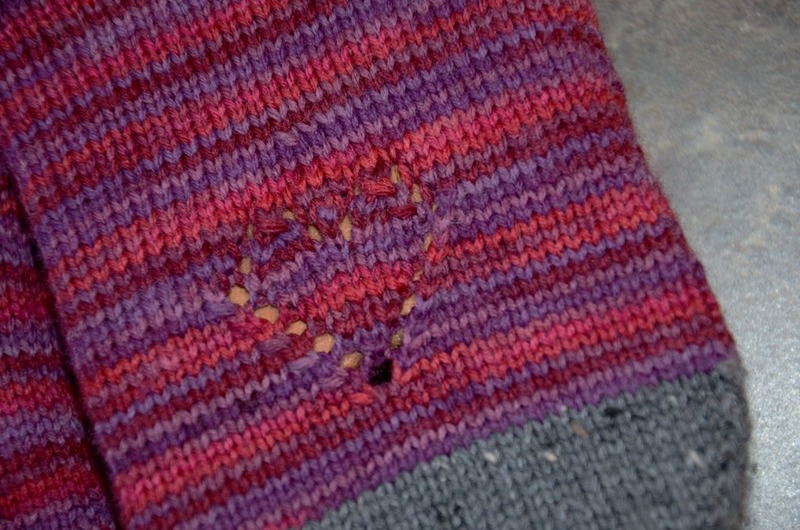 - Next came a color switch, since I knew that I likely wouldn't have enough to make the entire foot in the grey shade, I thought I might go for some Valentine themed socks and throw in some purple and pink shades! 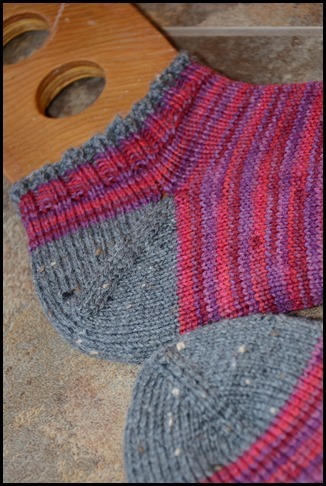 Gotta love the contrasting heels, toes and ribbing. Classic. - I improvised a lace heart on each of the toes. Just one on each foot. Simplicity Rules. - Then I knit until I was almost out of the Pink/Purple yarn on each foot, and did a short cuff with K2P2 Ribbing, and cast loosely with a stretchy bind off. - Another easy and simple pair of socks... maybe not the best design to keep feet warm in this wintery season (we just finished up with a snow and freezing rain storm over the weekend and there is another big white mess coming this evening!) but they're cute, they cleaned up a little of the yarn mess in my studio, and I think they will be perfect for lounging around the house. Plus - they match my housecoat! Win win win! SOCK TALLY FOR 2015 - 2 Pairs! 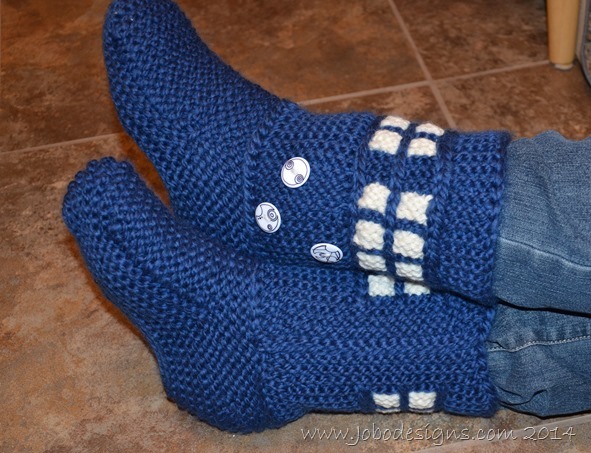 Tardis Slippers Bigger on the Inside? I have been working on my Dr Who slippers... And things are going quite well. 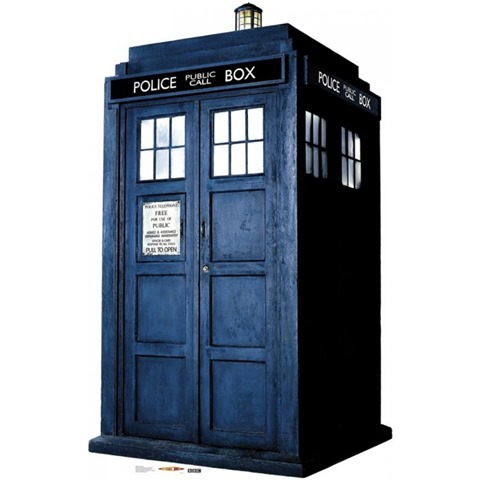 I finally had a chance to figure out how to do the TARDIS windows. Funny thing when my children refuse to sleep my creativity goes right out the window! 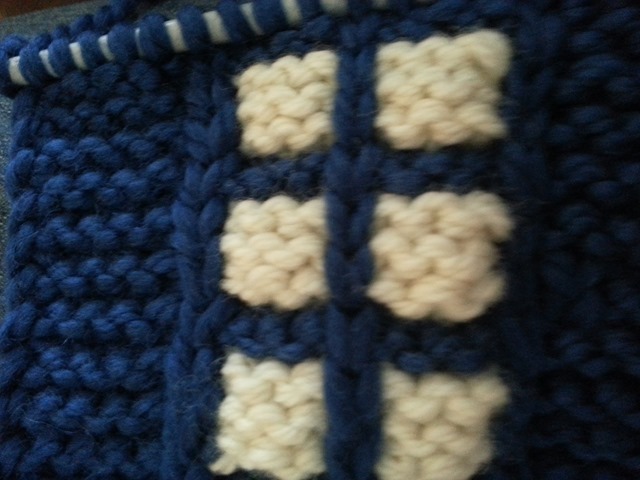 So I started out with the same needles as the base of the slippers, and just started to play with the white and the blue yarn. To get a comparable weight with the white yarn I had to triple the Patons Classic Wool. No biggie I just used the same technique as when you chain ply singles. I didn?t bother adding extra twist or anything? just held the chain together as I knitted. Maybe I?ll do a tutorial on this sometime if anyone is interested? As far as straying from the original pattern goes... I sort of went all out in all directions. 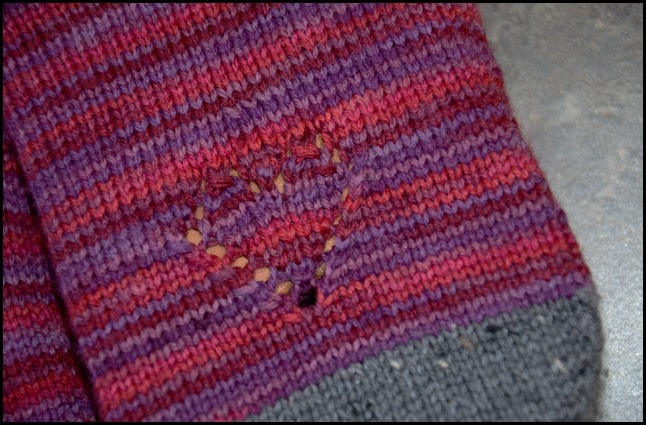 I started with the same approximate number of stitches and knit a button band to begin with that was wide enough to accommodate my buttons, and that's about where following the pattern ended. 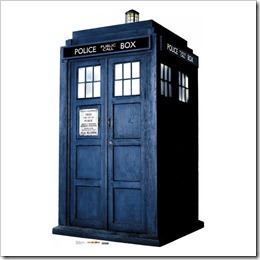 I looked at a bunch of drawings of the TARDIS to see how the windows should look and it appears that most of the drawings show clusters of 6 windows in a 2 x 3 pattern. 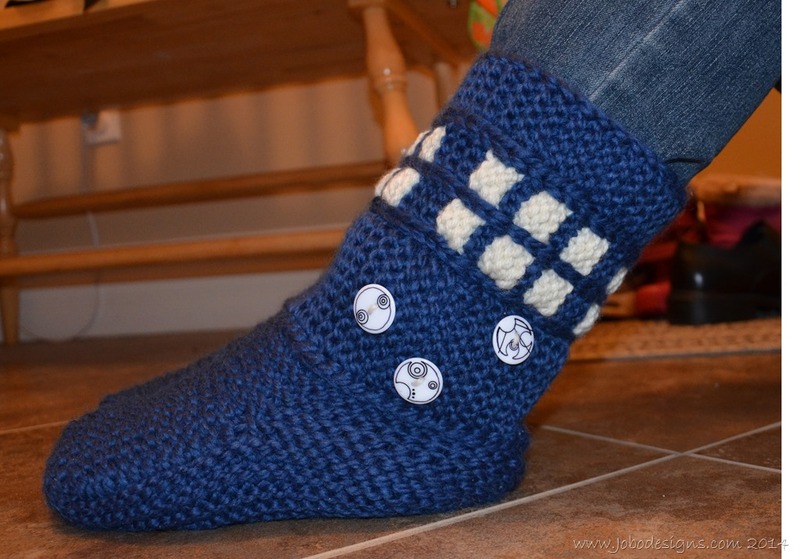 Now I'm just waiting to have enough energy to finish off the first ankle so I can sew it on and see what it looks like. 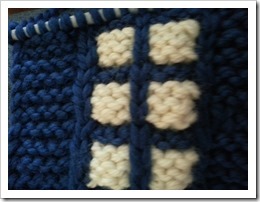 My colorwork in the back looks fairly tidy... But I am wondering if I should sew something over it to cover it up and make it look more professional. I wish I had some nice hundred percent wool felt or something. I really have to get some of Ruttiger's fur made in to felt sometime... another project for another day.